On my previous review, Lalitha, one of my long-time readers, commented that she might have watched Ore Kadal earlier but right now, she was only in the mood for an 'inane movie which does not require [her] to think or feel...'] That reminded me of Angoor, which is not inane by any stretch of imagination; this laugh-fest, is in fact, a brilliant adaptation of William Shakespeare's Comedy of Errors, and is one of those films which can be watched again and again - and again. It is the perfect comfort food to lift you out of the doldrums. This review is for you, Lalitha. While at the guesthouse, they are told of an abandoned pair of identical twins, and are asked by the tonga driver if they would adopt them 'insaaniyat ke naate'. No one else is willing to take the children home because they are not sure of the children's jaat (caste). Raj Tilak, for all his eccentricities, is a kindly man, and he and his wife decide to adopt the two babies, both of whom he names Bahadur. They will be companions/faithful retainers for their two boys. A few hours later, the family, now with an additional two babies, board the ferry. Surely you don't want me to tell you what happens to a family at sea in a Hindi film? Especially with identical siblings on board? Flash forward many years. Ashok1 (Sanjeev Kumar) and Bahadur1 (Deven Verma) are grown up; they were brought up by one Gangaprasad, whose munshi had rescued the boys and Raj Tilak; unfortunately, Raj Tilak died a day later. Gangaprasad brought the boys up with his own two daughters, Sudha (Moushumi Chatterjee) and Tanuja (Deepti Naval). He also married Ashok1 off to his elder daughter, while Bahadur1 has married Prema (Aruna Irani), the maid. It is a happy household, with Bahadur and Prema keeping house for Ashok, Sudha and Tanu. Well, mostly 'happy' since Ashok and Sudha are usually squabbling over something or the other. While all this is going on, Ashok2 and Bahadur2 (Sanjeev Kumar and Deven Verma again), who have been brought up by the twins' mother, are on their way from Dinkapur, to finalise a land deal. Ashok2 has an overactive imagination, and it is only rendered more vivid by his undying love for lurid crime fiction. Bahadur2, ever the faithful retainer as his twin, has a secret fondness for bhaang, that a dispproving Ashok keeps warning him against. Ashok's regular diet of crime fiction has only increased his natural paranoia, which is even more extreme because he is carrying a large amount of cash with him. He warns Bahadur that they have to be very careful about 'gangs' in the city. It appears that the 'gang' is very active - Ashok is 'recognised' as soon as they get down at the station, first by the station master who enquires about a basket of mangoes, and then by a man who thanks Ashok for getting his brother-in-law a job. Ashok is sure they are all part of the same 'gang' who is after his money. His suspicions are cemented when the taxi driver (Ram Mohan) asks him where he wants to go. 'Why should I tell you?' he asks the bewildered man. When he realises that he will have to give a destination, he tells the man to take him to Imperial Hotel across town, all the while insisting that he is not staying there. Back at the 'happy' household, Ashok1 is in a bad mood. He and Sudha have been quarrelling with each other since the previous night, and now he is no mood to eat breakfast. Sudha is sure he will go and eat breakfast at Alka's - she suspects Alka of being Ashok's mistress; right now, Sudha is quarrelling with him about a diamond necklace that he had promised to have made for her. Now Ashok has ordered a necklace for Sudha, but since it has been taking an inordinate time to be made, Sudha is impatient. Besides, she is sure that he's had other jewellery made for Alka. Ashok is so furious that he promises not to return home without the damned necklace! Tanu, of course, is a not-so-silent observer - she passes quite a few sarcastic comments about their 'love' for each other, and is forthright about her opinion of her sister's suspicious nature. In their room at the Imperial Hotel, Ashok2 has locked his money in the cupboard there, and placed the empty briefcase on the floor. (His brilliant reasoning is that the thieves, if they get in, will steal the bag, and not look into the cupboard.) Before he goes out, he gives Bahadur strict instructions - stay in the room (because 'gaaang') and guard the money. Don't get high on bhaang. Also, don't open the door to anyone other than Ashok, and even then, only if Bahadur hears him give the pre-decided signal. What signal? asks a bewildered Bahadur, even though he is used to his master's paranoia. 'Well, I'll knock three times with my nails, and then I'll sing a song', says Ashok. Which song, asks his long-suffering retainer? Well, says Ashok, Preetam aan milo...Fed up to the gills, Bahadur manages to wave him off. So Ashok goes off to meet the man so he can fix the deal, but not before he tests whether Bahadur will follow his instructions. Meanwhile, Ashok1 has stopped by at Chhedilal (CS Dubey), the jeweller's, again. The recalcitrant but jovial goldsmith, Mansoor miyaan (Yunuz Parvez) hasn't finished with the necklace yet. But he provides Ashok with the case and Chhedilal assures him fervently that the necklace will be ready for him by around 9 at night. Ashok2 has gone to meet a man outside town - he's the owner of the vineyard that Ashok is planning to buy. After a hilarious run-in with a worker, whom Ashok2 suspects of being part of the 'gang', he takes a bus back to town. He gets out at the local market, and is spotted by Bahadur1, who is doing the shopping for Prema; Bahadur is very surprised to see his 'employer' light a cigarette (Ashok1 prefers snuff.) and accosts him. Ashok2 is equally taken aback - hadn't he told Bahadur not to set foot outside the hotel? Bahadur tells him that he's come to shop for radishes, because Prema told him 'didi' always makes 'mooli ke parathe' when her husband is angry. Ashok2 is irritated - who is didi? Who is Prema? And who is this 'chhoti didi' that Bahadur is talking about now? He, Ashok, is not even married. Where did his biwi (wife) and his saali (sister-in-law) come from? While a flustered Bahadur is still trying to answer these irrational (to him) questions, Ashok changes the topic - what about the money? Bahadur1, obviously, has no clue what his (supposed) master is talking about. What money? Ashok2 is furious - what does Bahadur mean 'what money?' They talk at cross purposes for a while, and then Ashok, furious at Bahadur's temerity, slaps him and flounces off. He returns to the hotel (hiring the same taxi as before, but not before telling the taxi driver that he is not staying at the Imperial Hotel; he just has some work there! ), where Bahadur2 is completely taken aback at being accused of leaving the hotel, when he didn't. And the money is safely where Ashok left it! He has no clue what an exasperated Ashok is talking about, and gets more and more confused as Ashok gets more and more angry. Meanwhile Bahadur1, totally cofused, returns home to confide in Prema that their employer has gone off his rocker - he's been smoking, he denies being married to didi (Sudha), and what's more, he even denied knowing that Bahadur was married to Prema! Bahadur is worried - what will happen to didi now? Prema, who is also worried, insists that he tell Sudha, who is naturally disturbed at the news. Tanu is also disturbed, though she suspects that Bahadur might have been under the influence. Also, she tells her sister, it is all her fault. This must be Ashok's way of getting back at Sudha for her behaviour that morning. Though she brushes off her sister's concern, Tanu still orders Bahadur off to go find Ashok, and bring him back home. Go to Alka's and enquire there, she tells him. If he's not there, then check his office and the jeweller's. Tanu has a concert that evening, and she needs to be at the auditorium soon. A hesitant Bahadur visits Alka (Padma Chavan), who has no idea where Ashok is. She is predisposed to brush off Bahadur's concerns at first, but hearing what happened in the market gives her pause. When Bahadur also tells her that Ashok and Sudha had a fight that morning, she advises him to go check at Chhedilal's. Bahadur soon arrives at the jeweller's, where he finds Chhedilal being importuned by Ganeshilal (TP Jain), the diamond merchant. The latter is tired of his frequent trips to get the money for his diamonds, and wants it immediately. Chhedilal manages to send him off again - Ashok will be picking up the necklace that evening, so if Ganeshilal could come the next morning, he will settle all accounts. A reluctant Ganeshilal leaves the store, and Bahadur is soon regaling Chhedilal and Mansoor miyaan with exaggerated tales of the morning's happenings. Chhedilal tells Bahadur to come back at night. While all this is happening, Ashok2 and Bahadur step into the auditorium where Tanu is singing at the concert; once again, they are mistaken for Ashok1 and Bahadur1 and escorted to prime seats. Tanu, who has been livid that no one has bothered to come to hear her sing, is now shocked to see her 'jijaji' light a cigarette. Once her performance is over, she sends one of her friends to bring her brother-in-law (as she thinks him) backstage. Ashok2, who suspects that these are also 'gang' members, refuses to go; when the man insists, he sends a tip for Tanu. Tanu is furious - what does her jijaji think he is playing at? How insulting! She storms out to the foyer, and is taken aback when Ashok2 refuses to recognise her. Ashok, on the other hand, is completely flustered at having a strange young woman insist she is his sister-in-law. Their argument becomes a trifle heated, and attracts the attention of the local police chief, Inspector Sinha (Colonel Kapoor). He forces Ashok2 to go with him to 'his' house, and despite his protestations, leaves him to the tender mercies of Sudha and Tanu. Bahadur, who had been buying popcorn, follows them in what seems to be the town's only taxi. Sudha is relieved to have her husband back home (though not before she enquires about the necklace), but Ashok2 is horrified when Tanu urges Sudha to take him to their bedroom. Bahadur is dropped off in front of Ashok1's house, but not only finds no trace of his master, the outer gate is locked as well. Bahadur decides to sing their 'song', only it is Prema who opens the gate to him. She pulls him into the house, all the while complaining gently that he had stayed away far too long. She also puts him to work to grind the masala for the pakoras she is making. Not having an option, he does as she asks. Upstairs, Sudha is trying to make up with her 'husband' by pouring him a drink. They both talk at cross-purposes for a while, and then, Ashok is scandalised when Sudha asks him to change his clothes, teasing him about suddenly being embarrassed at changing in front of her. She also informs him, much to his consternation, that Bahadur is going to be a father. So when Bahadur2 shows up with the plate of pakoras, Ashok's first reaction is to ask him about his marriage and imminent fatherhood. For once, Bahadur is not listening. He quickly brushes all of Ashok's questions aside, and tells him not to eat the pakoras; Bahadur has laced them with bhaang. Ashok should ensure that Sudha and Tanu eat all of them, so that they can escape from this loony house. Ashok2 goes back into the room and begins to feed Sudha the pakoras, but in turn, is unable to resist the drink she continues to force on him. Back at the jewellers, Ashok1 is waiting impatiently for Mansoor miyaan to finish work on the necklace. Bahadur1 comes in hesitantly; neither he nor his employer understand what the other is talking about, but one thing is clear - Ashok is still mad at Sudha. Back in Ashok1's residence, one drink has turned to two, then three... but Sudha is soon unconscious from the bhaang and Ashok, now slightly tipsy, stumbles into Tanu's room, where he offers her the pakoras. She eats them, but comments that they taste funny. She also feeds them to Ashok who is now too drunk to resist. So while Tanu soon falls asleep because of the drug-laced pakoras, the alcohol-bhang combination is too much for Ashok and he too falls into a drugged/drunken stupor. Ashok1 and Bahadur1 decide to return home, tired of the interminable wait at the jewellers. Mansoor miyaan is a man who takes his own sweet time over his work, and Chhedilal quickly promises to have the necklace delivered to the house in the morning. Ashok1 is irritated as hell - he'd angrily told Sudha that he wouldn't return home until he had the blasted necklace. Now he will have to listen to her complaints all over again. Back in the house, once Prema is taken care of, Bahadur comes up to get his master only to find that Ashok is not responsive at all. Frustrated, he goes down to the kitchen again and meditatively eats the rest of the bhaang-laced pakoras. It is at this time that Ashok1 and Bahadur1 reach home. Ashok's irritation deepens into anger when he finds the courtyard gate locked. Bahadur1 offers to go to the back of the house to wake Prema up, but she is lying in a drugged haze, and it is Bahadur2 who hears them. Certain that these are the 'gang' members that his employer warned him of, Bahadur2 barks like a dog to scare them off. Ashok1 and Bahadur1 are thoroughly confused - where did a dog come from? And why isn't anyone, even Tanu, opening the gate to them? An angry Ashok decides that this was Sudha's way of teaching him a lesson; well, they will go to Alka's house for the rest of the night and they will get Chhedilal to deliver the necklace to Alka's house! Come early morning, Ashok2 wakes up, and manages to get hold of his Bahadur, who had fallen asleep on the stairs - they retrieve the keys to the outer gate from where Prema has hidden them, and escape. Both of them have had enough of this seemingly loony town. Bahadur tells Ashok that before they really get looted out of their money, it is best that they leave! Ashok agrees; he sends Bahadur to buy tickets on the first available train, while he goes to the hotel and packs up. On the way, Ashok2 runs into Mansoor miyaan who is on his way to deliver the promised necklace. Spotting Ashok, the goldsmith hands over the necklace to him, even though Ashok protests that he hadn't ordered any jewellery. Ashok1, waking up at Alka's, is still angry with his wife and the jeweller and everyone else. He sends Bahadur1 to get a fresh change of clothes from home, so he can go to Chhedilal's to collect the necklace before he goes home. What will Ashok1 do when he learns that Mansoor miyaan has already delivered the necklace - to 'him'? What does Ashok2 do with a necklace that is not his? How does Bahadur1 and 2 react to events that seem to be getting more and more confusing? And Sudha, Prema, Tanu and Alka - how are they going to react to the second Ashok and Bahadur? This is one of my go-to films when I'm feeling low, and if you haven't already watched it, you should! Both Sanjeev Kumar and Deven Verma shine in roles that could have deteriorated into farce in less-able hands. Everything - even the most outrageous scenes - are played with such understatement and deadpan humour that it is impossible to not burst out laughing. Since the Ashoks are 'identical' twins (who do not have an identifying mark), their characters are differentiated only by their way of talking/reacting. Other differences are that one of them is fond of snuff and liquor, while the other prefers cigarettes. Whereas, in the case of the two Bahadurs, Bahadur2 is definitely more intelligent and resourceful than his brother, who is a bit of a simpleton. The second Bahadur is also more critical of his employer (especially his obsession with crime) while the first twin is more used to confessing his troubles to his wife and letting her decide what he should do. Moushumi Chatterjee was not, at that time, considered a serious 'actress' so she is a revelation with her comic timing. She plays the suspicious nagging housewife with such control that one cannot help but root for everything to come alright for her in the end. Her Sudha is someone who takes everything quite literally, whereas her sister Tanu, played superbly by an aptly-demure Deepti Naval, has an impish sense of humour. Gulzar's screenplay was a reworking of his own screenplay from nearly two decades earlier. It was he who wrote the script for Do Dooni Char, a Bimal Roy production directed by Debu Sen, which was a reworking of the Bengali film Bhranti Bhilas, which in turn, was adapted from Ishwar Chandra Vidyasagar's play of the same name. And that play, in its turn, was an adaptation of the bard's Comedy of Errors; Gulzar offers a nod to his film's provenance during the end credits, when William Shakespeare winks at the audience from a lithograph on the wall. The chemistry between all the actors in the film is crackling, and with two pairs of twins wandering about the same locality, there is double the trouble, with everyone, including themselves, mistaking one for the other. Not to mention the spouses of one set of twins who suddenly have to deal with their spouses' doppelgangers. This, Gulzar's only attempt at comedy in an illustrious career, is a sparkling comedy that depends on its dialogues and the performances of the cast to elicit the laughs - and laughs there are aplenty. There is also physical comedy, not the slipping-on-a-banana-peel kind, but with Moushumi's constant crying and suspicions and her washing her eyes out - she spends half the movie, looking upwards, with a little cup clutched to her eyes, or crying at the drop of a hat. 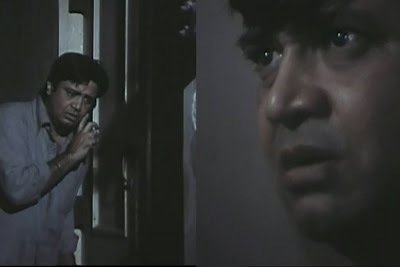 As Deven Verma said in an interview, if you think of it logically, what are the odds that a couple with identical twins will adopt another stray set of identical twins, that they will separate, each spouse with one of each set of twins, that the two sets of twins would grow up and meet under such circumstances? But while watching the film, logic doesn't matter. We accept the conceit, and from then on, hilarity ensues. The dialogues, especially the numerous references to 'Gaaang hai', or the scene where the two Ashoks are wondering at their similarities - Tumhare daaye kandhe pe til hai? Nahin toh... Mere bhi nahin hai! Phir toh hum dono bhai huye... It mocks the very trope (of separated siblings) that it is playing off! It is very difficult to do justice to this film with a mere synopsis of the plot. The fun lies in every bit of dialogue, as much as the actor's expressions, not just facial ones, but that of their voices as they speak. Shakespeare's plays are perfect Hindi film material, as Vishal Bhardwaj's wonderful trilogy of Shakepearean tragedies show. (We have our own versions of star-crossed lovers, so I honestly don't consider movies that use that trope to all be adaptations of Romeo-Juliet.) But his comedies transpose well enough to our shores, and it is a shame that it is only Comedy of Errors that has been adapted on Indian screen. (At least in Hindi; I am not sure if any regional film-makers have adapted any of his other comedies.) And so it is with a sense of pleasurable anticipation that I await Vishal Bharadwaj's proposed adaptations of a trilogy of Shakespearean comedies. In the meanwhile, do watch this one, if you haven't already. And if you have, well, watch it again. It's worth it! I have issues with Angoor. Having seen the Bengali original, I feel Gulzar's version is comparatively melodramatic and overdone. Uttam as the hero in a double role was more subdued that Sanjeev. Sabitri Chatterjee in the role of his wife gave one of her life's best performances. He sense of humour was subtle. It was more to do with expressions - her face, her eyes, etc, while Mousumi hams. The locale too was realistic, one could identify with this happening in a place which was something between a village and a town. And Bhanu Banerjee was probably the best comedian the country produced. Devan is no match. Issue is - Sanjeev, Devan, Mousumi - all are very good actors. Just that the combo of Uttam, Sabitri and Bhanu was much better. Maybe because the director stuck to the script which was based on the translation by Ishwarchandra Vidyasagar. Hindi films have the tendency to glamorize everything, Reason I find Chupke Chupke a very poor remake of Chadmabeshi too. It's been ages since I watched Angoor, Anu - in fact, I don't recall having watched it after that first time when I saw it on Doordarshan. But what a viewing it must've been, because I actually still remember (after about 30 years?) several of the dialogues and scenes. 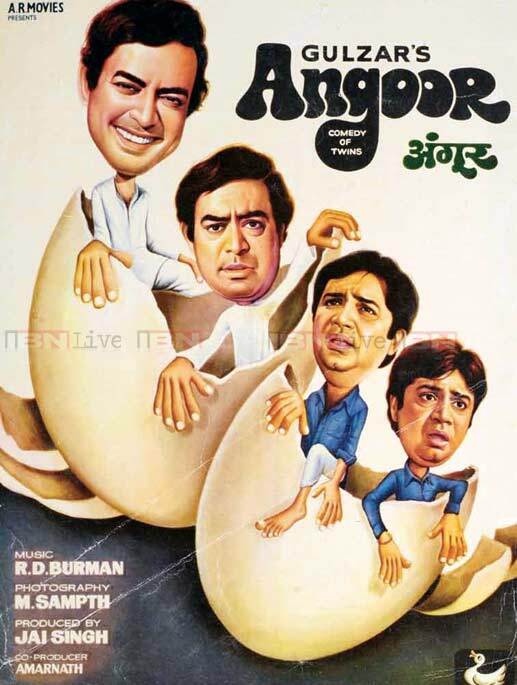 Utterly delightful film, and such a good showcase of Sanjeev Kumar's abilities as a comic actor. Thank you for that review. Enjoyed it a lot, and am now thinking I really should get around to watching this again. the question, of course, is: WDIGTT? (And Anirudha has made matters worse by recommending the Bangla original, because now I want to see that as well). I haven't seen the Bengali version, Anirudha, so I don't have anything to compare it with; having seen the Hindi versions of Malayalam films, I can imagine that the Bengali original would have been better. I should like to watch it as well. And because I haven't seen the original, I have always thoroughly enjoyed Angoor, and Chupke Chupke is another of my go-to favourites. I know, Madhu! I remember going about after first watching it delightedly saying gaaang hai! to my sister. I was in such doldrums and needed those laughs, so when Lalitha was talking about wanting something where she doesn't have to think, I immediately thought of this one. Thank you, thank you, thank you! I have just returned home after yet another sojourn in the hospital (fairly brief, thank God!) so I just finished reading your review. This is just what I needed while I was there, but that doesn't matter, I can watch it now - when I get the time! But this movie is definitely a laugh fest - I watched it about 15 years back, and I can still remember how good it was. Now that we have Youtube on TV, I can watch it on a larger screen, so it should be even better. And of course, I have always enjoyed watching Sanjeev Kumar, and since I don't remember the gaang hai ... part, I need to watch it again and soon. Thanks for thinking of me. I have to agree with Aniruddha about the fact that the Bengali versions of Hindi remakes are usually better with more restrained acting. I enjoyed Angoor though, probably because of the dialogues. But my vote for the best Bengali comedian would be Jahar Roy. Bhanu was sometimes very over-the-top. Soumya, I will not disagree. I hold the same view about the Malayalam originals of remakes in any other language! I am late, as usual! :-( the RSS feed does not work.... and I am busier than before, so forget to check it! Sorry! Lovely review, Anu. And what a delightful movie this one is... have watched it so many times - it is one of my go-to movies as well. The 'Gaang hai' part was so funny - Sanjeev Kumar, Deven Verma and Moushumi Chatterjee were hilarious. I recently rewatched Chupke Chupke, another one of my pick-me-up movies! I'm so sorry that the RSS feed isn't working properly, Harini. :( I'll see what I can do to fix it.